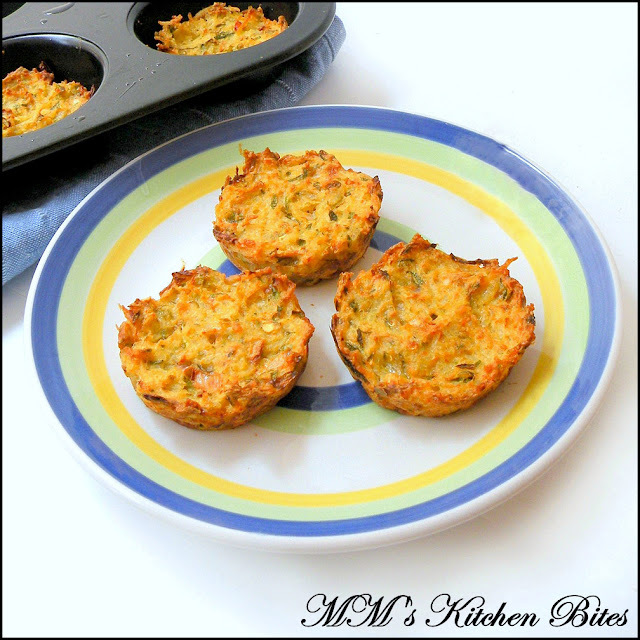 MM's Kitchen Bites: Crustless Zucchini Mini Quiche...what's in a name!!! Crustless Zucchini Mini Quiche...what's in a name!!! Grate zucchini and place in a colander. Salt it and keep it aside for 10-15 minutes. Squeeze out all the water from the zucchini. When you think you are done, squeeze it out again – one medium size zucchini should fill up about ¼ of a cup after this. This is an important step; otherwise the ‘quiche’ will either remain soggy or take even longer to cook - both unpalatable options. Whisk the egg lightly in a bowl. Mix in rest of the ingredients. Lightly spray a muffin tray with oil. Add around 1 heaped tbsp of mix into each mould – with the above quantity I got 6. Each mould needs to be filled up till about half way and not more. Bake for about 20-25 minutes, till tops get browned and go a little crispy. You can add additional cheese on top if you want, I didn't. was looking for something spicy for tea,this is perfect..